It's that time of year for the Winter Walk-off. This walk is hosted by Les over at 'A Tidewater Gardener'. Last year I participated with this post ' Walk Through the Neighborhood...' Last year I came out of the driveway and turned right. This year we turn left....The gravel in the top center of the picture is the top of my driveway. I share this picture to show the dip in the land. This will be referenced later in this post. And now, we turn our back on the driveway and walk.. The 'we' I keep referring to is of course the doggies. The black and white and gray one is Skyler, our Aussie, the only purebred. Newton, the black one, is part Aussie and Shepherd. Serving as our anchor (she stops and sniffs, re-sniffs, stops again, ready to turn back every few feet) on our twice a day walks is Monroe, our Chow/Shepherd mix. She is a tough old gal. This week marks her 18th birthday. I never thought she would make it so long. Our drive from Virginia to South Carolina was about 8 hours long...she paced the back seat, back and forth, the entire trip. That was 2010. She doesn't like walking this way because of the slope of the road....hard for her old bones to make it uphill. I know Les said not to take pictures of our garden...this is my septic field. I share this one only because I want you to see the slope of the land. See the rocks along the road? There is a low area on either side of the road...and a stream that runs under the road after a rain. In the top photo the rocks are on the left side of the picture. Some of the daffodils from last year are up and blooming...this will be my wildflower meadow in a month or so. Coming next to the low spot we can see down into the woods.... I love how the sunlight dances through the trees, illuminating the forest floor. In the photo above you see my name, this is where the wild blackberries are starting to leaf out. Last year some of the weekend folks came by with a carload of kids and picked it clean! See all the new growth? A big thicket of berry brambles. See how the brambles line the edge of the forest? Makes it tough to get through to wander in the woods. Wanted to share another picture of this lovely little blue/violet flower. Initial thoughts of it being a Bluet are agreed. A few of the neighbors have some nice natural rocks emerging from their property....these are at the top of two driveways. As I shared last year, I love the native grasses that turn a lovely shade of tan this time of year. After I put the dogs in the house I thought I should continue the Winter Walk-off. I traveled about 400 feet north... to the lake. I then turned in the same direction that I walked with the dogs along the road. The lake is still lower than what it will be in the summer. The level started coming up January 31st. During the winter the level is lowered for the health of the lake as well as allowing folks to do dock repair, and the turbine maintenance at the dam. It comes up about a half a foot every two weeks. Since no one lives on the 5 lots next to us in this direction, it feels like a nature preserve. The shoreline is lined with Hibiscus moscheutos. Love the seed heads that stay all winter. The dock you see in the distance is in disrepair, on a lot that has no house. The Herons like sitting on the roof and fishing for dinner from there. Another plant I have come to learn a bit more about it the Hazel Alder Alnus serrulata. The new female flowers are the red ones at the top of the photo, the male flowers are the catkins. The spent female flowers look like little pine cones. As the lake level is down, there are some really cool stumps--- I first thought this could be a neat piece of driftwood. WRONG! It is an old tree, still anchored quite firmly in the bed of the lake. At the corner of the cove by this driftwood is a large Vaccinium blueberry, not sure on the species. The flower buds and leaf buds are ready to open soon. I reached the cove, the end of my walk for today. Remember at the top of the post where I showed you the low spots on each side of the road? I said there was a stream that goes under the road when we have rain. Well, this cove is where it empties into the lake. Since we just had rain I decided not to walk further, it gets soggy underfoot. Thanks for coming along with me on my walk(s) today. Be sure to join Les in his challenge to post YOUR Winter Walk-off. This morning on our way out we saw a large flock of turkeys, ANOTHER bird that was missing on our bird count. There were at least 16 turkeys crossing the street as we approached. They hustled off to the left and into the woods. There is always one straggler. We were happy to see them, it has been months since our last turkey sighting. Where were we going this morning? On our way to get hardwood mulch. 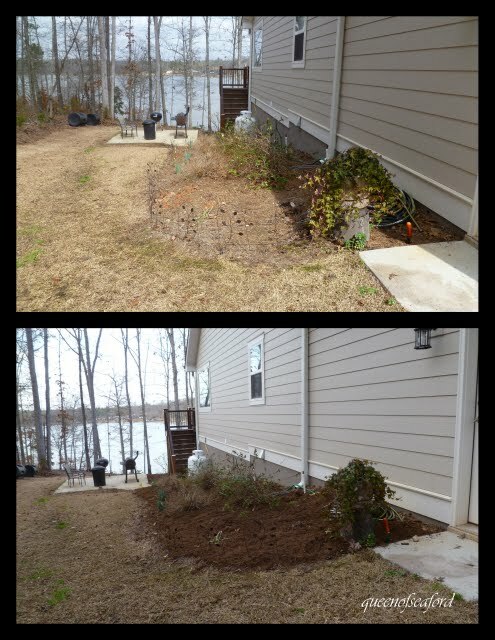 We had mulched the gardens around the shed and along the side of the property already. Remember how I moved some shrubs to the front garden? 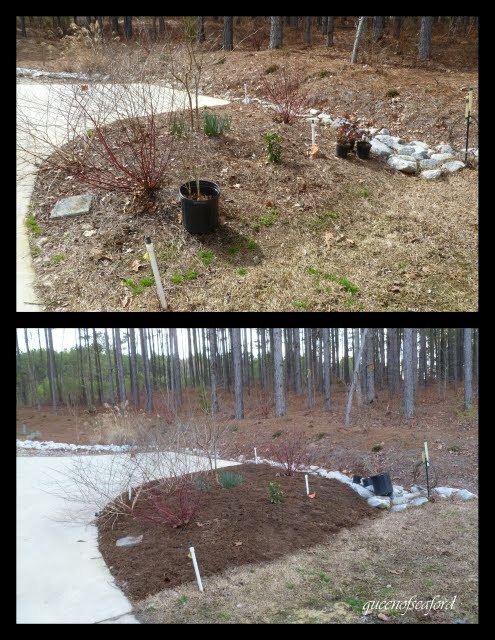 Well, they needed to be mulched (dressed). So today we made three runs to the place where we buy mulch. Each trip takes an hour total.....ah to live in the country. 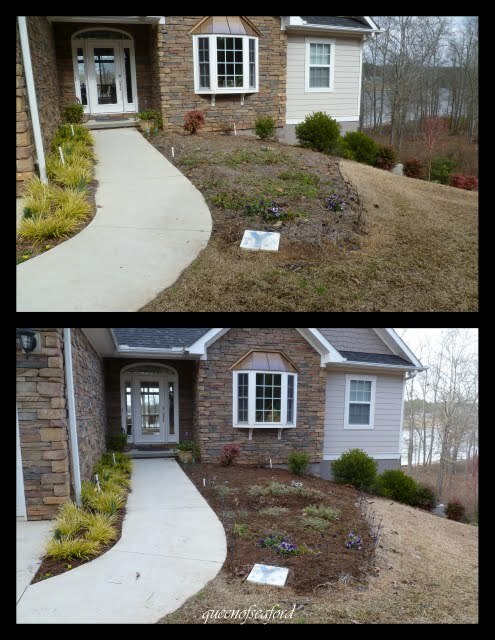 Here are the results---each picture has a before and an after. Now we are sitting with our feet up.....happy to have that done. Next job-- the backyard gardens. How was your Great Backyard Bird Count? Did you have lots of birds? A nice variety? Any unusual visitors? Did you see some spectacular birds? Were there any that were new to you? We had a Bald Eagle.....LAST WEEK! Did he show up again this weekend for the count?? Of course not. Our feeders looked like this most of the weekend. I waited for the 'prime feeding time' to do my counts. There were a few times I just gave up...no one was coming to the backyard. While walking the dogs I hear a Great Horned Owl...but I didn't see it, so no fair counting it. Finally I had a few visitors at the feeders and in the visible part of the backyard. A few of them wanted to see what they could find in my herb pots instead of the feeders. At one point there were about five or six of the Chipping Sparrows having an eating contest. I like this feeder, it was a birthday present from my sister in law. We have very few squirrels, but one has discovered the feeder....but to no avail- it works well. This evening I took my camera with me when I took the dogs for a walk. Will share some in a later posting. These were kind of fun, I don't usually use the flash, but the sun was going down and it was not as bright as I wanted for some of the photos. My bird count? Carolina Chickadees- 12, Tufted Titmouse- 14, Chipping Sparrow- 15, Carolina Wren- 1, Cardinal- 2, Yellow-bellied Sapsucker- 1, Pine Warbler- 1, Goldfinch- 3, Brown headed Nuthatch- 2. What about yours? This post is my 300th posting. It is hard to believe I finally hit the 300 mark. Since we moved to South Carolina I missed two anniversaries. I started this blog in early December 2008, so am into my fourth year. 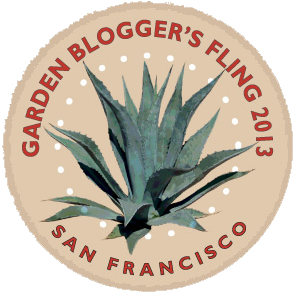 It has been a great adventure and I am really glad I started blogging. The wonderful friends I meet every day in the blogging world are just amazing. 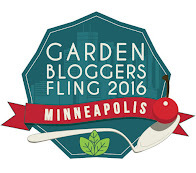 This coming spring I will get to meet many of the garden bloggers at the Garden Bloggers Spring Fling! It is like getting to meet a penpal face to face. 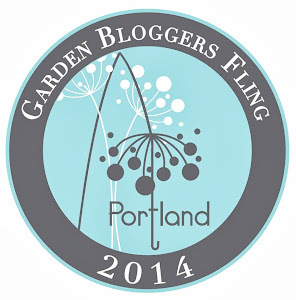 Today is the 15th of the month and that means it is Garden Bloggers Bloom Day, please make sure to go to Carol's blog. She has been hosting this great gathering for a long time! I just checked her sidebar, GBBD has occured 81 times! wow. So let's see what is blooming in South Carolina -- First is my favorite spring weed. This was taken along the roadside while walking the dogs. (Three dogs, a camera, and holding my jacket as it was warmer than I thought) These little flowers have four petals, ranging from lavender to dark purple. I have checked my sources and I do not have a firm ID. I think it is in the Houstonia family, but it is blooming in February! Any ideas? Bloom day in the winter wouldn't be complete without another shot of my lovely Daphne odora. Her blooms are few now, but I have great expectations for winters to come! The Muscari I planted last year are starting to bloom. They are circling a sundial next to the driveway. If you look closely you can see some black ears...my shadow, Newton. I believe this is Narcissus 'Foresight' blooming now. I have three daffodil blooms open right now...but just wait a month!! The red flowering Quince has some swelling buds. Can't wait for them to pop open. Over the last two years we planted eight Osmanthus fragrans, Tea Olives. These guys have been blooming since last fall! Their fragrance is out of this world. Coming into the backyard you find the Edgeworthia chrysantha. I shared the close-up before, but I wanted you to see the shrub in its lovely naked winter glory. I love this plant. 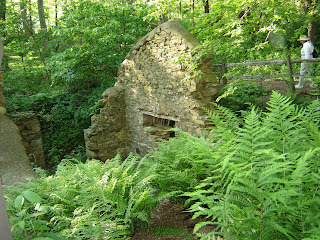 In the summer the leaves are large, oval, kind of velvety, and blue green, shading the ferns under them. Many of the hyacinths are coming up. I have pink and dark pink. 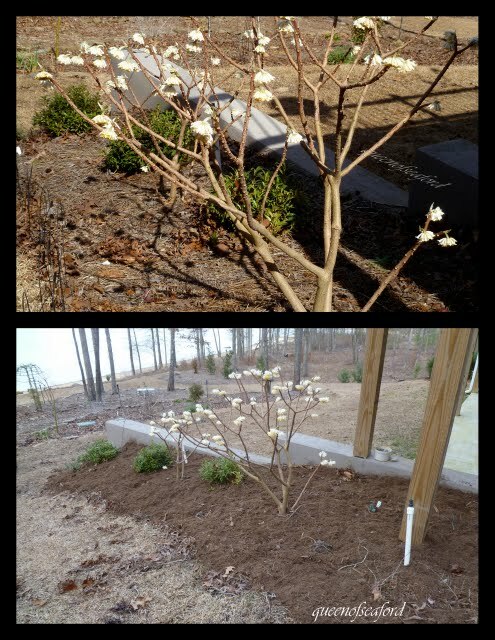 Here is another view of the Edgeworthia,(there are two) along with the Sarcococca hookeriana, soon the Sarcococca will be blooming. Right now the buds are plumping, getting ready to open. I made this photo larger... see the umbrella looking thing in the background? It houses some Carolina Jasmine and a native honeysuckle. Can't wait for it to be covered! Also under the Edgeworthia is my Hellebore 'Pink Frost', almost open. Lower in the garden towards the water are the other Hellebore, they are really blooming a lot more than last year. One plant that hasn't done gangbusters, yet, is my Pulmonaria longifolia 'Diana Clare'. She is full of buds this year and one is open. While I was walking around the garden I noticed I had some company. These little anoles will rustle the leaves and I think somebody is walking up on me. They are fun. Blooms that you don't think about as 'blooms' are on my shrubs. This is the Myrica cerifera, Wax myrtle. And this is the Cryptomeria japonica 'Black Dragon', busting with flowers. Thanks for joining me on this Bloom Day. I appreciate all the comments you all share. This blogging experience has been a wonderful trip...here's to 300+ more! !